The early Closed French Championships tournament is still shrouded in a great deal of mystery. It appears that at the beginning it was not even a tournament as such, but just a series of matches known as the inter-clubs tournament, played between male members of different French clubs, usually Parisian ones, at different venues, sometimes over a few weeks, beginning in late May or early to mid-June. It all began in 1891, with a men’s singles event (as such), which was won by a H. Briggs, possibly an Englishman. He was able to take part because the events were open to both French players and overseas players who were members of French lawn tennis clubs. A men’s doubles event existed from an early stage too. The women’s singles event was inaugurated in 1897 and won by (Françoise) Adine Masson. In its early years it appears to have been an extremely modest affair and might not even have been held in certain years during the period in question. A Challenge Round appears to have existed in all events, though not necessarily in the early years. A mixed doubles event was added in 1902; a women’s doubles event was first held in 1907. Last edited by newmark401; Dec 10th, 2011 at 09:58 AM. The first winner of the women's singles event at the Closed French Championships was (Françoise) Adine Masson, the best of the early French players, although she appears to have been of French-Canadian origin and a relation, probably the daughter, of Armand Masson. The latter played an important role in the promotion of lawn tennis in France in the early years. Adine Masson's first name appears to have been Françoise, although most sources just refer to her as Adine Masson. A Willy Masson, who also played competitive lawn tennis at this time, was the son of Armand, so probably Adine's brother. According to the book "Lawn Tennis at Home and Abroad" (1903), Adine Masson "... is good, both forehand and backhand; possesses a long, hard drive with plenty of swing; places well and keeps good length. She is, however, apt to be a trifle reckless and at times goes too much for her stroke. In a mixed double she is a tower of strength." The first women's singles event, if it can be called that, at what was the French Closed Championships took place on one day, Wednesday, June 23, 1897. The venue was the lawn tennis club located on the Ile de Puteaux, a small island on the Seine. It was played separately from the men's singles event, the semi-finals and final of which were played the following Sunday at a different venue, the Tennis Club de France, also in Paris. In the final Adine Masson beat a P. Girod, in what "Le Figaro" newspaper called a hard-fought contest. No score is given. The runner-up was a married woman, so the P. might stand for Paul or Pierre. In any case, her identity is well hidden. It is very likely that Adine Masson retained her singles title at the Closed French Championships in both 1898 and 1899 without having to play a match. In other words, she was unchallenged in those years when she was easily the best female player in France. The same was true at the Covered Court Championships, held at the Tennis Club de Paris around Easter. Adine Masson won the singles there in its early years in the mid- to late 1890s, but the women's singles event then lapsed for a number of years due to the lack of competition. Last edited by newmark401; Dec 10th, 2011 at 09:53 AM. Yvonne Prévost, or at least a Mlle Prévost, won the women's singles title at the Closed French Championships in 1900. Together with Adine Masson, Yvonne Prévost was the best of the early French female lawn tennis players. According to "Lawn Tennis at Home and Abroad", "Mlle Prévost plays a hard, steady game, and possesses a very severe forehand stroke, and places well. She is very quick about the court and if she could only improve her backhand she would be very hard to beat." There is little doubt that Yvonne Prévost existed. In 1900, she was also runner-up at what is now recognised as the first women's singles event at the Olympic Games, held that year at the lawn tennis club located on the Ile de Puteaux in Paris. However, more than one reliable contemporary source also mentions a Hélène Prévost playing lawn tennis in France at this time. Yvonne and Hélène could have been sisters, or related in some other way. The book "Lawn Tennis and Abroad" (1903) refers to Mlles Masson and Prévost, indicating that neither player was married. In 1901, the women's singles event at the Closed French Championships was won by Mme P. Girod, who defeated a Mlle Leroux (first name unknown) in what appears to have been the All-Comers' Final. "Le Figaro" newspaper mentions that the score was 6-1, 6-1 and that "Mlle Prévost" was not defending her title. Mme P. Girod had been runner-up in the inaugural women's singles event four years earlier. Adine Masson won the women's singles event at the Closed French Championships again in 1902 and 1903, in other words for what were probably the fourth and fifth times. In 1903, she beat Kate Fenwick in the final match, 6-0, 6-8, 6-0. Last edited by newmark401; Dec 10th, 2011 at 09:50 AM. The years 1904-1908 are probably the most obscure in the history of the women's singles event at the Closed French Championships. However, it is clear that Kate, or Katie, Gillou won the event in question every year during this period, except in 1907. "Le Figaro" mentions Kate Gillou several times during these years and includes a short report on her wedding to a René Fenwick in March 1906. Kate had a lawn tennis-playing sister called Antoinette, who was not quite as good as her. In 1905, Kate Gillou defeated Yvonne de Pfeffel, 6-0, 11-9, in what appears to have been the last match of the women's singles event at the Closed French Championships. Kate was more than likely the defending champion. Yvonne de Pfeffel was one of two lawn tennis-playing sisters, the other being Marie-Louise de Pfeffel. Their father was German-born, hence the occurrence of "von Pfeffel" in some sources. 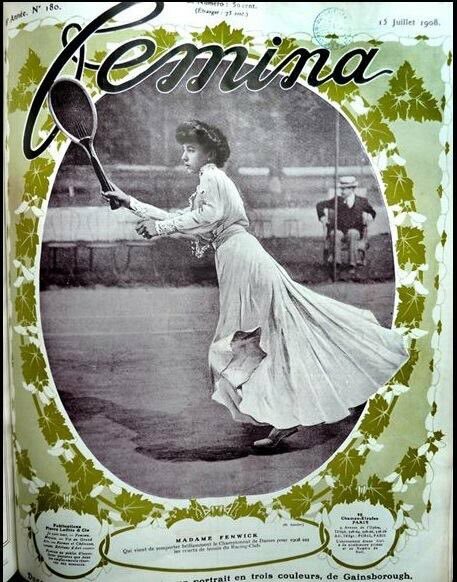 The other winner of the women's singles event at the Closed French Championships during this period was the Countess de Kermel, born Thérèse Villard on 15 June 1874. She married Count Olivier de Kermel in Paris, France, on 30 September 1899. ("Le Figaro" had announced their engagement a few months earlier.) In the final match at the Closed French Championships in 1907, the countess won the first set, 6-1, against a Mlle d'Elva before the latter retired. It appears that Katie Fenwick was not defending her singles title in 1907. Mlle d'Elva, the runner-up, is one of the most obscure players to have taken part in the Closed French Championships. She did not play much competitive lawn tennis at all. Last edited by newmark401; Dec 10th, 2011 at 09:51 AM. It is relatively easy to say with certainty who won the women's singles event at the Closed French Championships from 1909 onwards. In 1909, the Closed French Championships as a whole were held outside Paris for the first and only time, the venue being the Société Athlétique de la Villa Primrose club in the port city of Bordeaux, on the south-west coast of France. It was in Bordeaux that Jeanne Matthey won the women's singles title at the Closed French Championships for the first time. In the last match, which might have been an All-Comers' Final, she beat a Mme Gallay, 10-8, 6-4. This player was not the Jacqueline Gallay who would play lawn tennis in the 1920s because Jacqueline Gallay was born in 1903, one year after her sister, Violette, who would also play competitive lawn tennis. Neither the first name nor the maiden of the Mme Gallay who was runner-up at the Closed French Championships in 1909 is known. Jeanne Matthey had a lawn tennis-playing sister called Cécile, but Jeanne was by far the better player of the two. In 1910, Jeanne Matthey retained the singles title at the Closed French Championships which from this year onwards were played on the clay courts of the Racing Club de France in the Bois de Boulogne in Paris. In 1910, Jeanne Matthey beat Germaine Régnier in the Challenge Round, either 8-10, 6-1, 9-7 or 10-8, 1-6, 9-7 (one French newspaper reported the result incorrectly). In 1911, Jeanne Matthey won the singles title at the Closed French Championships for the third year in a row. In the Challenge Round she beat Marguerite Broquedis, 6-2, 7-5. The latter player (b. 17 April 1893) was arguably the best female lawn tennis player to come from France before Suzanne Lenglen. In 1912, Jeanne Matthey won the women's single title at the Closed French Championships for the fourth consecutive and last time. In the Challenge Round she defeated a married player, Marie Danet, 6-2, 7-5. Marie Danet was the mother of Roger Danet, who would play competitive lawn tennis in the 1920s and have a relationship with Suzanne Lenglen. Despite her success in the Closed French Championships, Jeanne Matthey did not win any tournament of any significance outside France. However, during her career she did manage to beat Suzanne Lenglen in a singles match twice. Jeanne Matthey's first victory came over Suzanne Lenglen came in 1912, in the semi-final of the tournament held in Compiègne, France. Jeanne Matthey won the match 6-3, 6-1. Suzanne Lenglen was 13 years of age at the time. Jeanne Matthey's second victory over Suzanne Lenglen came in the final of the tournament held in Chantilly, France, in early July 1913. Jeanne Matthey won this match 7-5, 6-1. No other player ever beat Suzanne Lenglen twice in a singles match of any kind. Last edited by Rollo; Apr 13th, 2012 at 08:02 PM. In 1913, Marguerite Broquedis ended Jeanne Matthey's four-year reign as Closed French Champion when she beat her in the Challenge Round. The score was 6-3, 6-3. Marguerite Broquedis' other successes include victory in the inaugural edition of the World Hard Court Championships, held in Paris in June 1912. In the final she beat the German player Magdalena "Mieken" Rieck, 6-3, 0-6, 6-4 (the German player reversed the result at the same stage of the same tournament in 1913). Marguerite Broquedis also won the gold medal in the outdoor singles event at the 1912 Olympic Games, held in Stockholm, Sweden. In the final she beat the German player Dora Köring, 4-6, 6-3, 6-4. In 1914, Marguerite Broquedis became the first Frenchwoman to play in a final at the Wimbledon tournament when she and the great New Zealand player Anthony Wilding were runners-up to James Parke of Ireland and the Englishwoman Ethel Larcombe, the final score being 4-6, 6-4, 6-2. It appears that Marguerite Broquedis liked to play an attacking game and was a skilled volleyer. In 1914, Marguerite Broquedis retained the singles title at the Closed French Championships when she beat the 14-year-old Suzanne Lenglen in the Challenge Round, 5-7, 6-4, 6-3. This was the last time Suzanne Lenglen ever lost two sets in the same singles match. Last edited by newmark401; Sep 17th, 2011 at 07:53 PM. Last edited by Rollo; Apr 13th, 2012 at 07:56 PM. 1897 FI: Adine Masson d. Mme P. Girod 6-3, 6-1. Verified. 1898 Adine Masson enters but is unchallenged as champion. Verified. 1899 Adine Masson enters again but is again unchallenged as champion. Verified. 1900 Yvonne (or Hélène) Prévost is the only entrant and thus champion without playing a match. Verified. 1901 FI: Mme P. Girod d. Mlle Leroux 6-1, 6-1. Verified. 1902 FI: Adine Masson d. Mme P. Girod 6-0, 6-1. Mme P. Girod, the holder, played through. Verified. 1903 FI: Adine Masson d. Kate Gillou 6-0, 6-8, 6-0. Masson is champion for the fifth and last time. Verified. 1904 Kate Gillou beats Adine Masson in the final match. The finalists are verified, but the score is not clear. 1905 FI: Kate Gillou d. Yvonne de Pfeffel 6-0, 11-9. This might just have been a handicap event. Verified. 1906 Kate Fenwick (née Gillou) d. Virginia MacVeagh (USA). The finalists are verified, but the score is not clear. 1907 FI: Countess Thérèse de Kermel d. Mlle d'Elva 6-1, retired. Not verified. 1908 FI: Kate Fenwick d. A. Péan 6-2, 6-2. Verified. 1909 FI: Jeanne Matthey d. Mme Gallay 10-8, 6-4. Verified. 1910 Jeanne Matthey d. Germaine Régnier 1-6, 6-1, 9-7. Verified. 1911 Jeanne Matthey d. Marguerite Broquedis 6-2, 7-5. Verified. 1912 FI: Jeanne Matthey d. Marie Danet 6-2, 7-5. This is Jeanne Matthey's fourth consecutive and last win in the singles event. Verified. 1913 FI: Marguerite Broquedis d. Jeanne Matthey 6-3, 6-3. Verified. 1914 FI: Marguerite Broquedis d. Suzanne Lengen 5-7, 6-4, 6-3. Verified. Last edited by newmark401; Dec 20th, 2011 at 05:48 PM. French Wikipédia did not know the First Name of Y de Pfeffel and is wondering of the source of this information. Yous seem very informed about the beginning of Roland Garros Tournemant. Can you indicate were you get all this information from so we can source Wikipedia better than just this forum ? When Mark returns he can answer better than I, but you can be rest assured about the first name, and it should be fairly easy to source if you have access to French geneology sites. Yvonne was the younger sister to Marie-Louise, who just so happens to be the great grandmother of London's mayor. Marie-Louise was the sister of Yvonne de Pfeffel, who also played lawn tennis in the first decade of the twentieth century. Their German-born father was Christian Hubert Freiherr von Pfeffel, a "freiherr" being a baron. He moved to France at some point and died in Paris. Marie-Louise and Yvonne could probably have styled themselves as baronesses. Their mother, Hélène (née Arnous-Rivière), appears to have been French. Most information on the web concentrates on Marie of course, but this site proves the relationship. Look under "D" for De Pfeffel. winners of rounds were Melle. Marie Louise de Pfeffel and Melle. Masson. tennis in Paris; notably Melles. De Pfeffel, Masson and Abbott. M.M. Plassard. See, H. Amy, Pilassant, and George Hetley. Mme Katy Fenwick in 1907 from the magazine "Femina"